Fast, non-volatile memory - its framtastic! You're probably familiar with SRAM, DRAM, EEPROM and Flash but what about FRAM? FRAM is 'ferroelectric' RAM, which has some very interesting and useful properties. Unlike SRAM, FRAM does not lose the data when power is lost. In that sense it's a durable storage memory chip like Flash. However, it is much faster than Flash - and you don't have to deal with writing or erasing pages. This particular FRAM chip has 64 Kbits (8 KBytes) of storage, interfaces using SPI, and can run at up to 20MHz SPI rates. Each byte can be read and written instantaneously (like SRAM) but will keep the memory for 95 years at room temperature. Each byte can be read/written 10,000,000,000,000 times so you don't have to worry too much about wear leveling. With the best of SRAM and Flash combined, this chip can let you buffer fairly-high speed data without worrying about data-loss. VCC - this is the power pin. Since the chip uses 3-5VDC you should pick whatever the logic voltage you're using. For most Arduino's that's 5V. HOLD - this is a 'wait' pin for the SPI bus. When pulled low, it puts the SPI bus on hold. This is different than the CS pin because it doesnt stop the current transaction. Its good if you want to talk to other SPI devices and stream data back and forth without stopping and starting transactions. Woops, the above has VCC and GND both connected to ground - Instead, connect VCC to the red power rail! Connect the MISO pin to the SPI MISO pin on your Arduino. We'll be using Digital #12 which is also the hardware SPI pin on an Uno. Connect the MOSI pin to the SPI MOSI pin on your Arduino. We'll be using Digital #11 which is also the hardware SPI pin on an Uno. Place the Adafruit_FRAM_SPI library folder your arduinosketchfolder/libraries/ folder. You may need to create the libraries subfolder if its your first library. Restart the IDE. Thats it! Now open up the serial terminal window at 9600 speed to begin the test. The test is fairly simple - It first verifies that the chip has been found. Then it reads the value written to location #0 in the memory, prints that out and write that value + 1 back to location #0. This acts like a restart-meter: every time the board is reset the value goes up one so you can keep track of how many times its been restarted. which means the other 3 pins are the hardware SPI defined pins for your chip. Check the SPI Reference page for details on which pins are which for your Arduino! Hardware SPI is faster (the chip can handle up to 20MHz), but you have to use fixed pins. Software SPI is not as fast (maybe 1MHz max on an UNO), but you can switch pins around. We dont cover how to protect subsections of the FRAM chip. It's covered a bit more inside the Datasheet. For advanced users, we have two functions to set/get the Status Register. IF you want to set the status register dont forget that WP must be logical high! 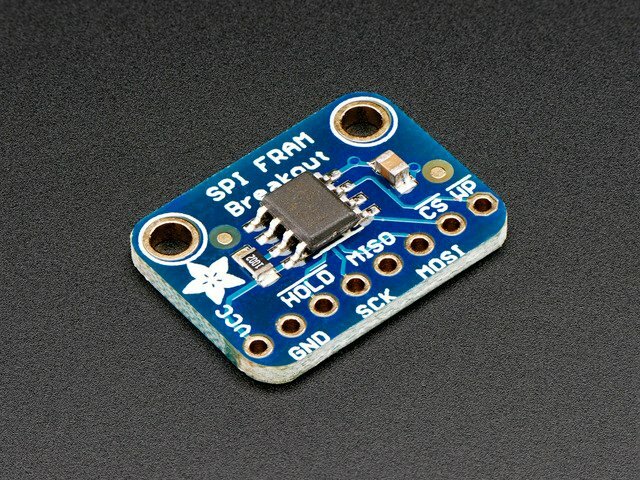 It's easy to use the SPI FRAM Breakout with Python or CircuitPython and the Adafruit CircuitPython FRAM module. This module allows you to easily write Python code that reads the humidity, temperature, pressure, and more from the sensor. First we'll wire up a SPI FRAM Breakout to a microcontroller, as was shown in the Arduino Test page. The CircuitPython library takes advantage of the software level write protection on the SPI FRAM chip, so using the hardware write protection isn't necessary. However, the hardware write protection could be useful with an external source of control, like a separate microcontroller. You'll need to install the Adafruit CircuitPython FRAM library on your CircuitPython board. Before continuing make sure your board's lib folder or root filesystem has the adafruit_fram.mpy, and adafruit_bus_device files and folders copied over. To demonstrate the usage of the breakout we'll initialize it, write data to the FRAM, and read that data from the board's Python REPL. ## Create a FRAM object. ## Read that byte to ensure a proper write. ## Or write a sequential value, then read the values back. ##       problems on memory-constrained platforms. This guide was first published on May 23, 2014. It was last updated on May 23, 2014.